Matt Crafton, driver of the No. 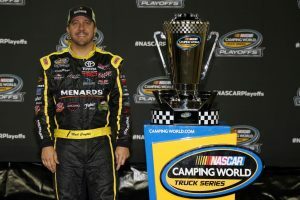 88 Black Label Bacon/Menards Toyota Tundra made his 400th career start in the NASCAR Camping World Truck Series in Friday night’s TheHouse.com 225. Starting fifth, Crafton finished seventh in Stage 1, and third in Stage 2, but a spin on lap 107 of 150 relegated the ThorSport Racing driver to a 16th-place finish in the ninth annual event at the 1.5-mile track. The two-time champion also qualified for the NASCAR Playoffs and will race for a third championship in 2017. In nine starts at Chicagoland Speedway, Crafton has led 38 laps en route to one pole (2009), three top-five, and five top-10 finishes. In 16 starts in 2017, the Menards driver has led 196 laps en route to one win (Eldora), four top-five (Atlanta), and 10 top-10 finishes. In 400 career starts, Crafton has 13 poles, and has led 2331 laps en route to 14 wins, 101 top-five, and 236 top-10 finishes. Up Next: The UNOH 175 at New Hampshire Motor Speedway on Saturday, September 23 at 1:00 p.m. ET.